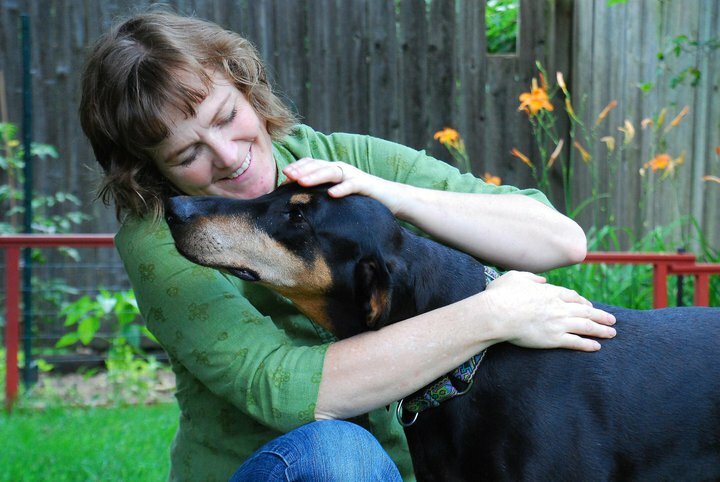 In early 2010, I was browsing the Illinois Doberman Rescue website, missing my Doberman, Sara, who had died of cancer a year before. 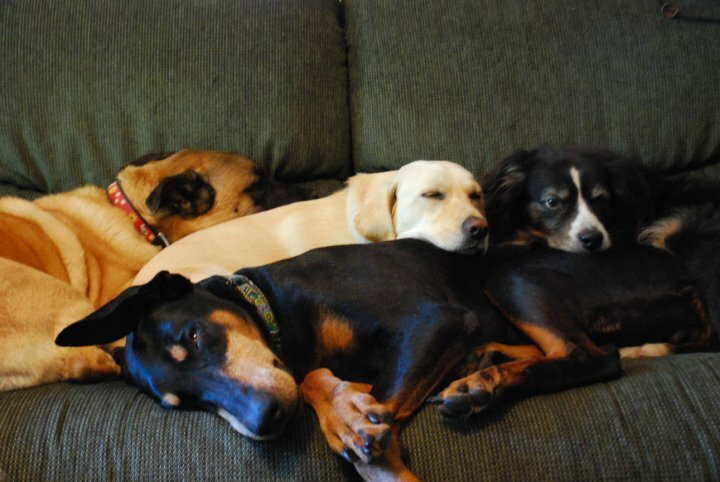 “We still have five dogs,” I thought. “It’s safe just to look, we can’t possibly get another dog right now,” I thought. Then I saw her face. 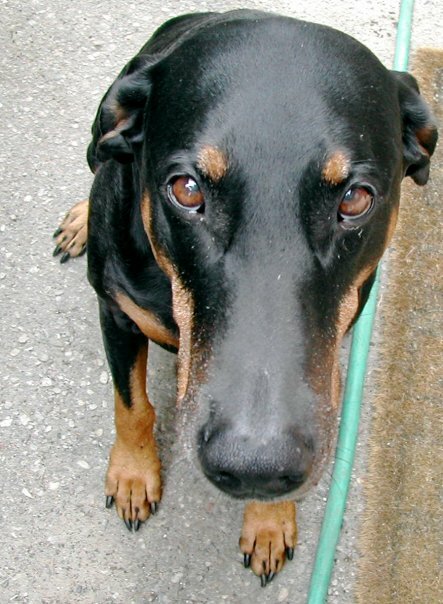 A black and tan girl with huge, expressive natural ears and a graying muzzle. She looked so much like Sara. Then I saw her name. “Sarah.” Oh dear. Before you knew it, applications had been filled out and approved. We met Sarah in her foster home, and she was as sweet as advertised. Maybe sweeter. Her coat was still sparse, dry and flaky, she had a big lick sore on one leg. “She doesn’t know how to get up on furniture,” they said. “That’s about to change,” we thought. Renamed Farrah, this senior girl fit into our lives as though she’d always been here. Even our sometimes dog-aggressive dog Kenya, perhaps remembering being raised by the original authoritative Sara, didn’t mess with her. Barry started calling our new dog “Sara on Prozac,” she was so different from our first Dobe. Less serious. Completely overjoyed with life. The first morning, we were greeted by a big submissive grin, and then Farrah boinged onto the bed. She dug her sharp elbows into Barry’s stomach, flopping between us onto her back, with her big wolf paws waving in the air, inviting a belly rub. “Maybe she is a Fifi,” I admitted. Later, we heard a funny noise from the living room. Wham! “Hubbabubbabub.” Wham! 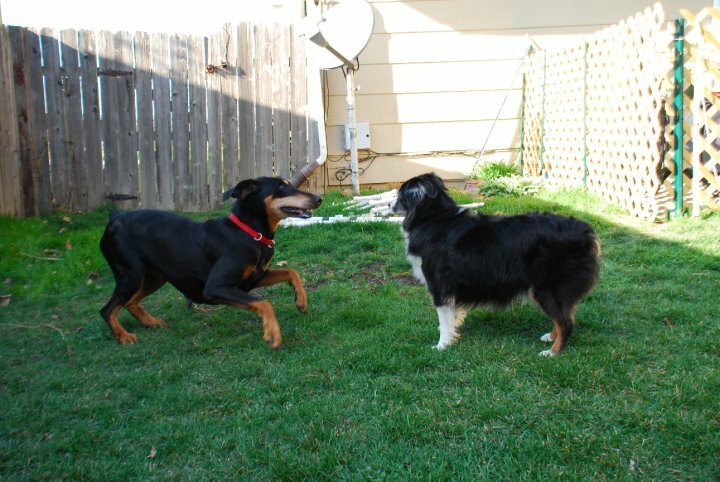 “Hububbabub.” Racing to see if something was wrong, we found our “senior” doberdog repeatedly play-bowing to our youngest dog Aleli, attempting to get her to play. They eventually developed a ridiculous play style, with Farrah repeatedly “measuring” Aleli’s head with her jaws while making dinosaur or hubbabubbing noises,” and Aleli just accepting this with her usual good nature. We took her to the barn. She was great with cats and horses. I took her to work. She won over everyone with her sweet face and growing repertory of dog tricks. 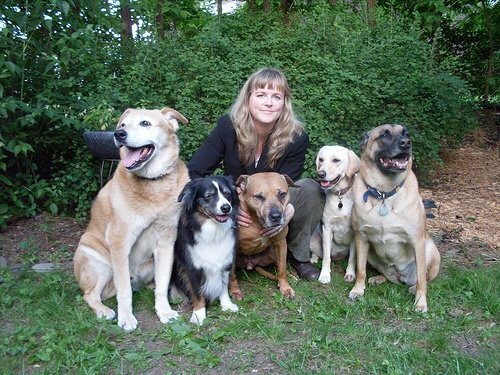 She went to obedience class, and learned as quickly and eagerly as any young dog. She earned her Canine Good Citizen award. She really was one, in every sense of the term. Fifi discovered stuffy toys, found out that pillows were not, in fact, also stuffy toys, gnawed on the corners of the coffee table, found out she was supposed to gnaw on rawhides instead, discovered that although dog beds technically *made* good potties in that they were convenient and absorbent, you were actually *supposed* to potty outside. She was an excellent snuggler. She measured Lili’s head frequently. She learned to work treats out of a Kong, how to get into a car, how to sit for her dinner, and all the other lessons most dogs learn when they’re just puppies. And she starred in our annual Christmas photoshoot. 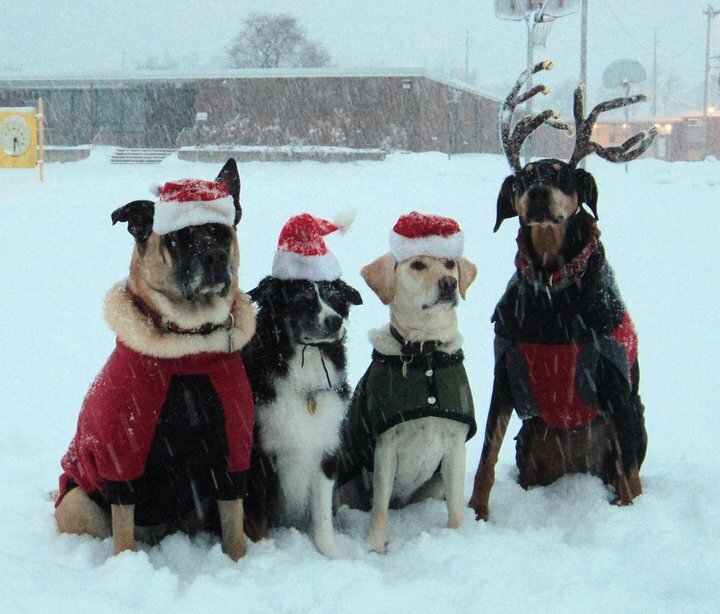 The Doberman is always the reindeer. Fifi adored being an indoor dog, always fluffing up her dog bed and giving a last happy little moan as she went to sleep at night. She woke up unbelievably happy every morning, delighted to find herself indoors with her people again. She was always ready to play with anyone, human or canine. 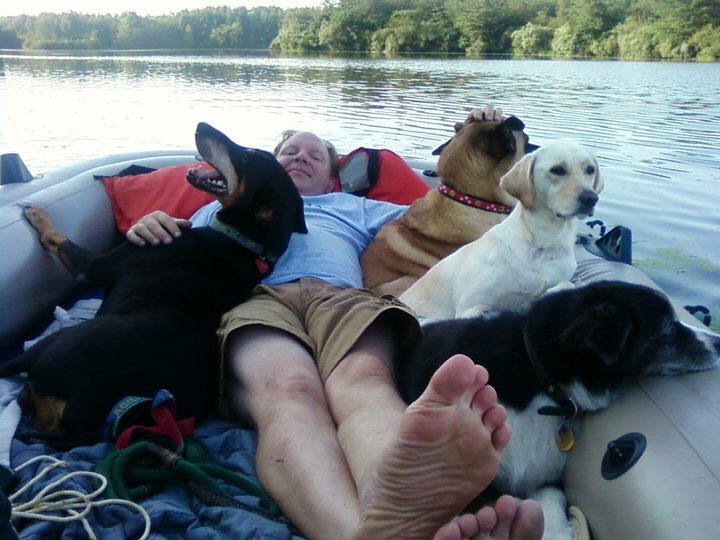 The original Sara, always a suspicious doberdog, had hated our rubber raft. The one time she went out in it, she trembled splay-legged the entire time, apparently terrified we were going to tie a concrete block around her neck and throw her overboard or something. Fifi, on the other hand, took to the raft immediately. While the other dogs remained on high alert, watching for fish jumping or deer coming to the shore to drink, Farrah snuggled up, rolled on her back and solicited another belly rub. Camping was a different story. On her first camping trip, Farrah seemed insulted to find herself once again tied to a tree. On the *dirt. * “You humans call this *fun? * This is how I lived for years!” We had to fetch a dog cushion from the car before she’d deign to lie down. And she flat-out refused to walk into the tent, which was completely filled by a large air mattress. It was too wobbly and weird for her liking, plus it was still technically outside as far as she was concerned. “I’m not an outside dog any more.” She slept in the car. She did love running on the beach in Michigan, though. First off leash beach run! 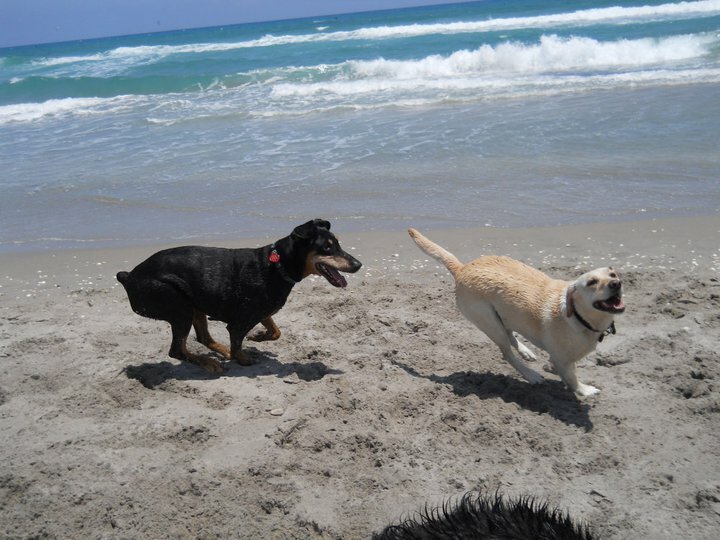 We went to Florida that first winer, and Fifi discovered the beach, salt water, tiny, enticing lizards to chase. 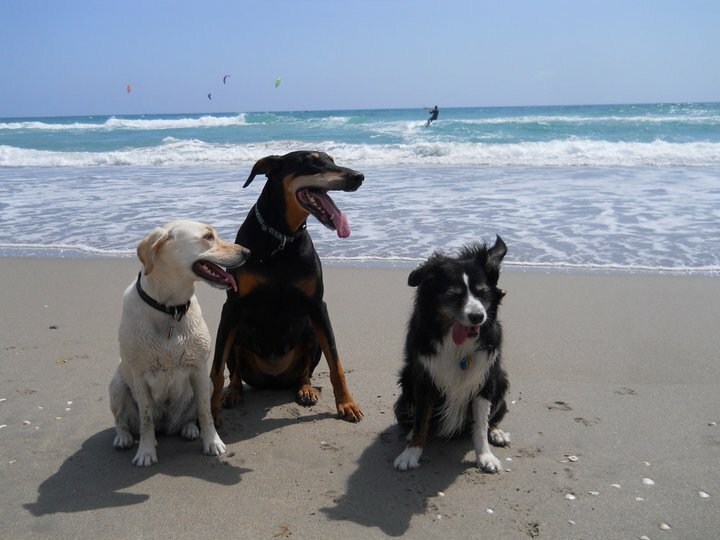 She was a model citizen on the long car ride, in the rental place, and on Jupiter dog beach, which may be the closest thing to heaven our dogs have ever seen. We were lucky to have so many great vets to help out with Farrah’s health challenges, especially Dr. Jacobs of Sports Vet and Karla Smith at the ASPCA. During her time with us, Farrah battled blastomycosis and had an episode of bloat. The cancer came back in her lungs, inoperable, but she remained happy and showed no signs she was uncomfortable. In October, 18 months after she came home with us, Fifi had three frightening grand mal seizures. It looked like the most likely diagnosis was brain cancer. We decided to let her go before she had to go through another one. 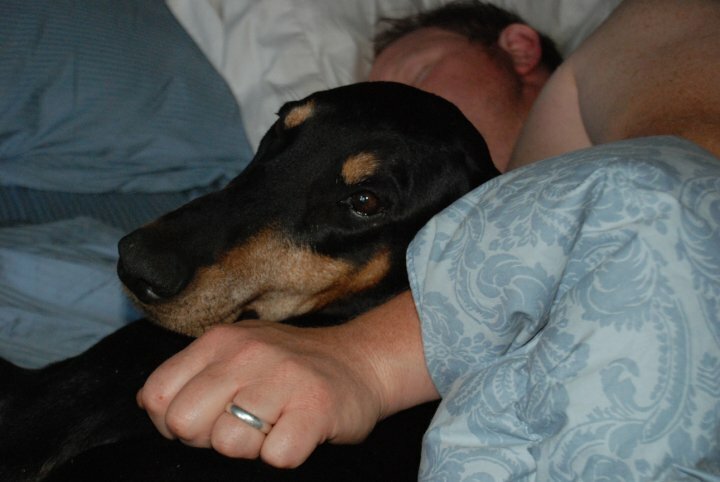 It was such a privilege to share our lives with you, Fifi the Doberdog. Would we adopt another senior dog? Absolutely. Love this beautiful story. We have one very difficult elderly four-legged that keeps us from rescuing older pups. Somewhere down the road we hope to follow in your footsteps. Too many senior pups that need a loving, warm, squishy household to retire in. I am left speechless by Fifi’s tale. All blessings on you and your wonderful husband for affording this old girl the chance to get in touch with her inner dobe. 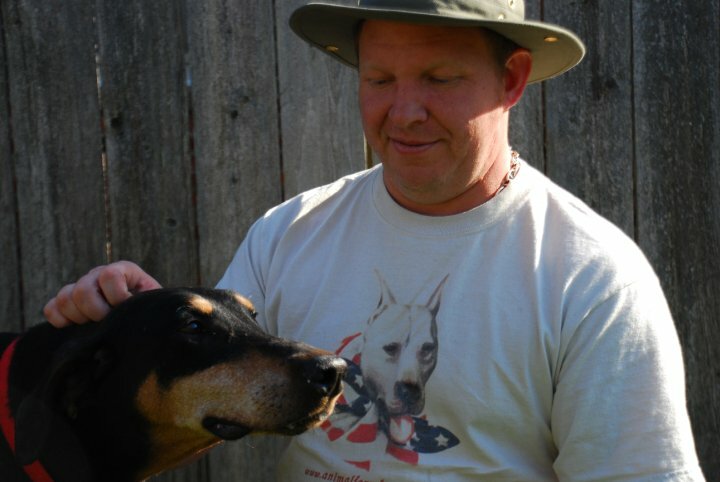 After reading this, I spent a long time thinking about why rational (arguably) people get involved with rescue on any level–whether as adopters, fosters, volunteers or professionals in a shelter environment, and I came to this conclusion: in all of us is a need to “level the playing field” for creatures who have suffered great injustice. It empowers us and allows us to believe humans can be better than we often are and the world can be a better place than it often is. At least that’s the answer for me and it’s taken me 40 years to really understand. So, thanks Trish and human and dog family.